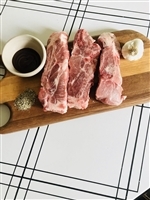 These ribs come in a whole slab that you can either cut to your choosing or cook as a rack. Smother with your favorite sauce and grill or slow cook. Average size is around 2.15 lbs. Baby Back Ribs are the epitome of classic ribs! They are delicious from our farm, so that you will have to buy 2 packs to enjoy. Delicious and irresistible with your favorite sauce! Average weight per pack: 1.2 lbs. 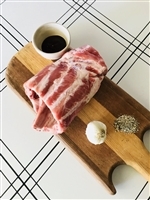 These ribs are ready for individual serving for your family or guests. Grill them to your liking, or slow cook them for an excellent dinner! Look at the meat on them:: DEELISH! Average weight per pack: 1.5 lbs.